영아부는 0-18개월의 영아들이 부모님과 함께 예배드리는 처소 입니다. 부모님의 신앙이 자녀들에게 뿌리내려 자라도록 돕습니다. 영상 화면을 통해 어른 3부예배를 드리십니다. 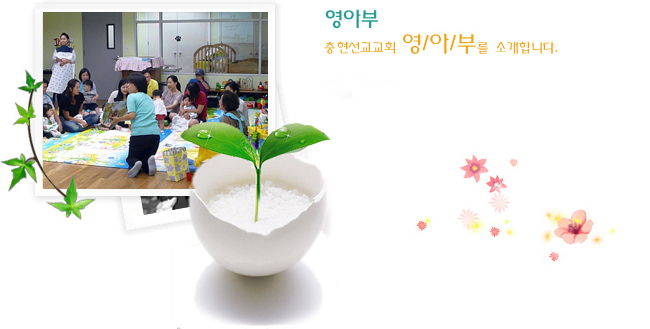 Choong Hyun Mission Church Infant department is a place where infants (0 to 18 months) and parents can worship together. Young infants at our department praise and worship together with their parents, and learn God’s love. The parents help their children’s faith in God get rooted and grow by caring for them in this department. Parents and infants worship together in the infants’ room, and on alternate weeks, the parents can listen and view the third service sermon on screen.